Mellor’s Catering Service have been the appointed Catering Contractor at Trinity School since September 2013. We have been and will continue to supply locally sourced, fresh food to the school. We are planning to work even closer with the school staff and pupils in the future to improve the quality of food and service on site. Why not visit the Mellors website www.mellorscatering.co.uk for more information on the service they provide. 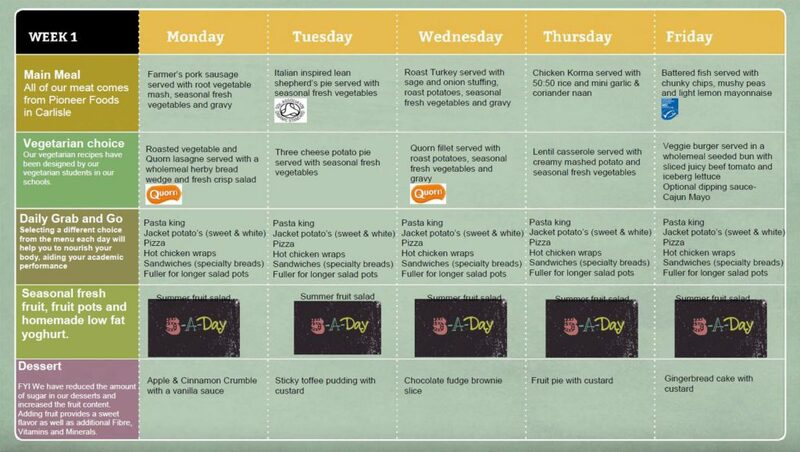 Everyday there is also the option of Jacket Potatoes with fillings, TuGo Pasta with at least two varieties of nutritionally balanced sauces. We have also introduced Chicken Joes Boxes as a High St Grab & Go offer. This gives the option of a Hot Oven Baked Chargrilled Chicken served with Jacket Wedges. To compliment this we also offer Hot Chicken Naan Breads as well as Marinated Chicken Flatbreads with a choice of sauces. TuGo concept Pizza and a Street Food Offer Alternatively there will be an array of cold pre boxed sandwiches, pasta pots, cous cous pots, Boxed salads available in two different sizes as well as our Build Your Own Deli Bar, Freshly baked Baguettes and a range of Speciality Breads with a wide variety of Salads & Protein Items. We hope you enjoy your Catering Experience at Trinity School. A representative from Mellor’s Catering will attend School Council Meetings and will welcome your feedback. Mellors Catering Services has been appointed to provide catering services at Trinity School. We are naturally delighted with this appointment and will work closely with the school staff and pupils over the coming months to improve the quality of food and service on site. Mellors Catering Services is part of Mellors Food Group, and operates some 140 catering contracts in the North of England, mainly within Primary and Secondary schools. Payment Great News, school meals are now even better value! We have worked closely with your school to ensure that you receive better value. We will therefore be able to maintain the price of the meal deal at £2.15. We offer a morning break and a lunch time service. Each morning at Break (10.35am – 10.55am) a catering service operates in the Dining Hall, selling a wide variety of snacks plus cold drinks. Many students from all year groups enjoy spending part of their break sitting with friends over a drink or a snack. 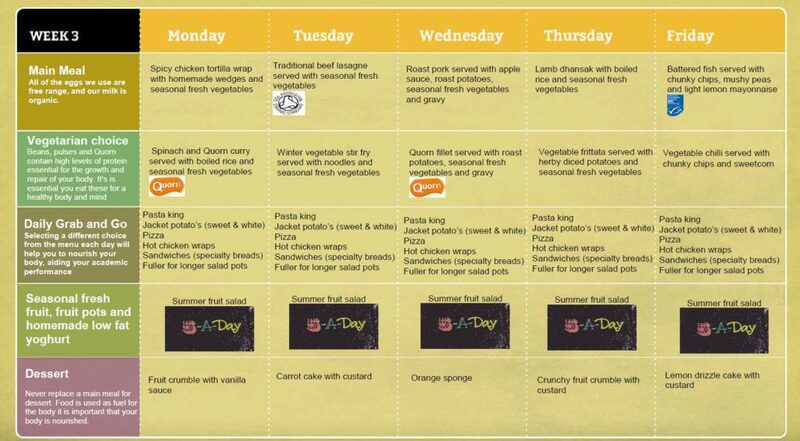 Each Lunch time (11.55am – 1.00pm) we offer a full range of lunch time meals available in the dining facility. In addition, light breakfasts are available from 8.00am- 8.20am. To ensure a pleasant lunch-time dining experience in the 7 – 11 school, the hour is divided between the daily tutorial session and recreation time. At any one time, two houses will be either dining or working with their form tutor. This ensures that queuing time is minimised and recreational time is maximised during this important part of the day. On a Friday, whilst retaining manageable numbers; students are afforded different opportunity to enjoy the lunch period with peers from their own year group. We also provide an additional service in The Bistro for the Sixth Form only. This starts at 8am and is open until 2.30pm. We do ask that food and drinks are not taken out of the dining rooms, or eaten anywhere else on the premises, in order to minimise litter and spillage. As a Healthy School, please note that canned drinks are banned from school premises and students bringing their own snacks are asked to ensure they conform to our Healthy Eating Policy, which has been drawn up in conjunction with the School Food Trust guidelines. For further information relating to menus, themed day events, tariffs, etc, please take a look at the school website. 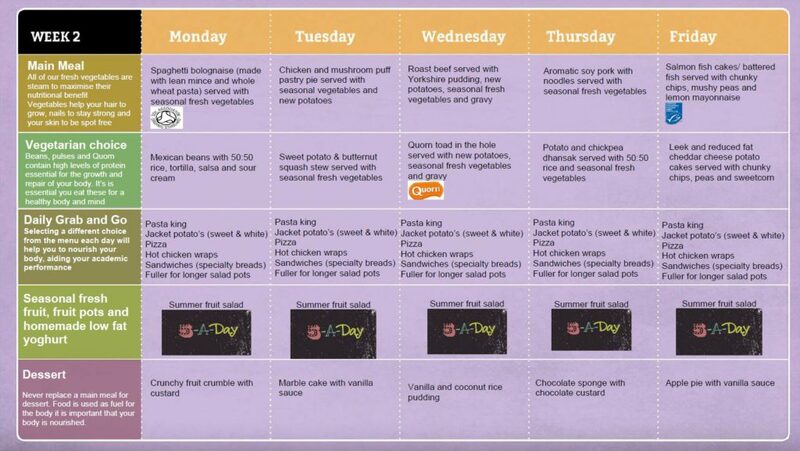 The onsite catering team welcome any suggestions you may have regarding menu choice, and we invite you to come and speak to us about any specific dietary requirements your child may have. Please speak directly with your school, or indeed fill in a comments slip or call the Mellors Customer Hotline on 07947 730620. We look forward to building a healthy school meal relationship with you all and above all, serving your child great, tasty food. Thank you, the Mellors Team. As above with addition of Pre Packed Sandwiches, Toasted Pannini’s Porridge & Syrup, Pizza Triangles, Cheese on toast, Fresh Fruit Salad Bar, Granola Pots. Congratulations to our in house catering provider, Mellors Catering Services who scooped the highly prestigious Contract Caterer of the Year Award at the Cost Sector Catering Awards in London last night. This is a fantastic achievement for all Mellors staff and is a true indication of the growth and success of their catering service. Trinity School Carlisle are proud to work in partnership with such a highly recognised contractor who provide an outstanding catering service for our students/staff and visitors. 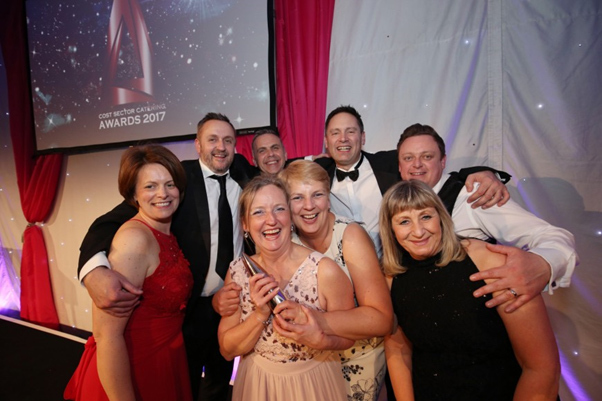 Mellors Catering Services, the family-run contract caterer that operates across the North of England last night scooped the prestigious Contract Caterer of the Year award at the Cost Sector Catering Awards in London.